Tumblr is hosted blog software, which means that you don’t need to have web hosting, a domain name, or anything more than the capability to access the website in order to get started. Point your web browser to Tumblr. 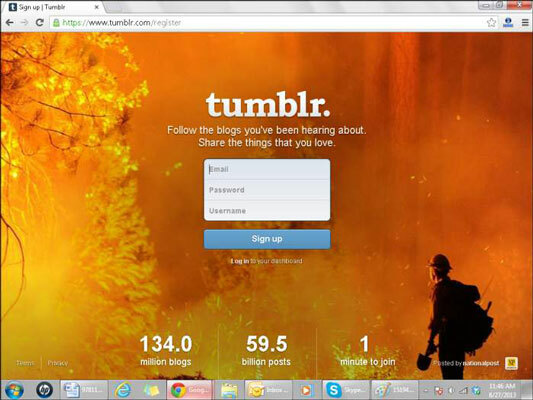 The main Tumblr page opens. Type your e-mail address into the Email Address text box. Type a password of your choice into the Password text box. 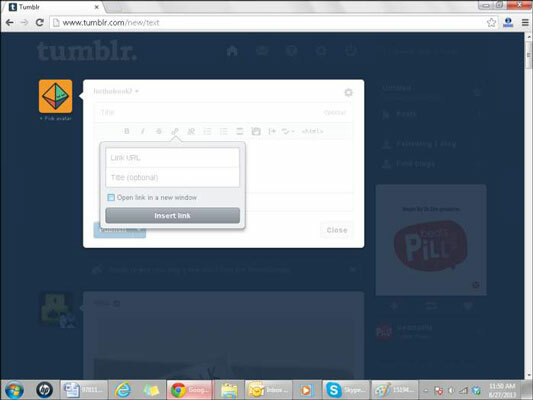 Tumblr loads a visual test called a CAPTCHA to make sure you are a human and not a spam script. Provide your age and accept the Tumblr terms of service. Click the Text Post icon (a capital and lowercase letter A) on your Tumblr dashboard. Tumblr displays the Add a Text Post page. (Optional) Give your blog post a title in the Title field. Type the text of your blog post in the Post field. Use as much or as little text as you want. If you’re ready, you can post to your blog right now by clicking Publish, or you can spend a little time making your post fancy. 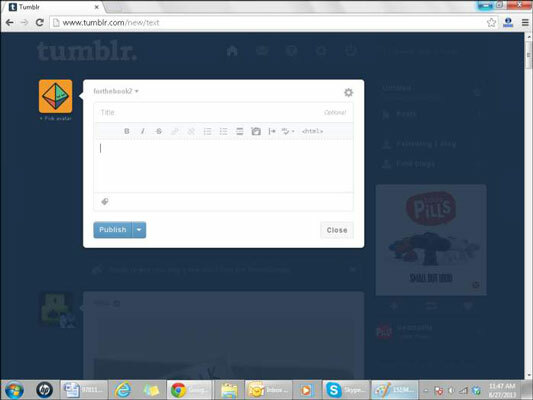 Tumblr, like most blog software, gives you the ability to format your blog post while you create it. The icons just above the content field, enable you to format what you’ve written. Bold: Make any text in your blog post bold by clicking and dragging over the text that you want to affect and then clicking the Bold icon. The selected text is made bold. Italic: Italicize any text in your blog post by clicking and dragging over the text that you want to affect and then clicking the Italic icon. The selected text is then shown in italics. Strikethrough: This style is commonly applied to text that you need to correct. Click and drag over the text that you want to affect and then click the Strikethrough icon. The selected text is then made . Insert/Edit Link: Make any text or image in your blog a clickable link to any website. Unlink: You can remove a link that you added by clicking the linked text or photo and then clicking the Unlink icon. Ordered List: In web browsers, ordered lists usually appear as numbered lists. You can most easily use this tool by typing each list item into your blog post on a separate line. Click and drag to select all the items; then click the Ordered List icon. Unordered List: In web browsers, unordered lists are usually displayed as bulleted lists (like this list you’re reading right now). Insert “Read More” Break: Break up your post so that only part of it appears on your blog’s home page and the rest is visible when the visitor clicks through to the permalink — the page that shows only the post — page. Blockquote: Indent a paragraph clicking anywhere in the line or paragraph of text that you want to affect, and then selecting the Blockquote icon. Your text moves to the right. Toggle Spellchecks: Not a great speller? (You aren’t alone.) Click the Spellcheck icon to run a spellchecker on your text. If you click the small arrow to the right of the icon, you can choose another language for the spellcheck default. Edit HTML Source: Are you an HTML guru? If you want to edit the source code of your blog post directly, click the Edit HTML Source icon and go to town. If you want to add an image to a text blog post on your Tumblr blog, you can upload a digital image directly from your computer. Simply click the camera icon in your Text Post window toolbar and select an image file from your computer. Uploading pictures that don’t belong to you? Don’t forget to respect copyright law! Select text or click an image in your blog post. Click the Insert/Edit Link tool (it’s a small piece of chain). 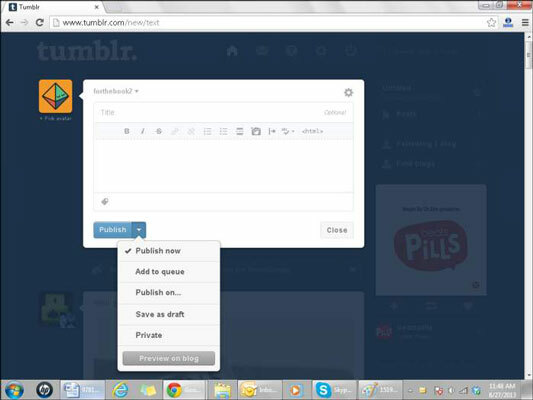 Tumblr opens the Insert/Edit Link window. Type or paste a URL into the Link URL text box. (Optional) You can give a descriptive title to your link in the Title text box if desired. (Optional) If you want to open the link in a new web browser window, select Open Link in a New Window from the Target drop-down list. Click the Insert link button to add the link to the text or photo in your blog post. The link isn’t clickable in the editing screen because you’d have trouble formatting or removing the link later if it was. If you want to remove a link that you’ve created, you can easily do it. Simply click the text or photo on which you placed a link, and then click the Unlink tool. When you finish everything that you want to do to your blog post, it’s time to publish! Simply click the Publish button, and your post appears on your blog for others to view.